Max Payne at its most surreal and self-aware. 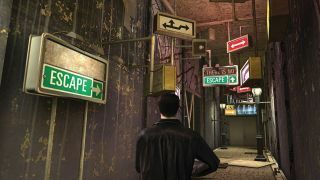 Address Unknown is the inspiration for A Linear Sequence of Scares, a brief but memorable level from the first act of Max Payne 2. Max visits contract killer Mona Sax, who’s hiding out in an apartment above an abandoned funhouse based on the show. Max comments that the place was shut down after the series was cancelled in the ’90s. But as he makes his way through it, the place is fully operational, complete with corny jump scares and cardboard recreations of scenes from the show. Later, Max escapes into the inner workings of the funhouse, where the animatronic characters who populate it are stored. Remedy was obviously proud of its advanced physics system, and one of the rooms here is full of props to knock over and shove around, including a ball placed near a tempting pyramid of paint cans. And it’s this area that leads Max to Mona’s hideout, where he finds her in the shower singing Late Goodbye, a song by Finnish band Poets of the Fall that is heard throughout the game. While I love Max Payne 3, it couldn’t be more different from Remedy’s entries in the series. Rockstar’s game is a macho revenge story served straight-up, but the games written by Sam Lake feature elements of the surreal, of mythology and the occult. This isn’t always successful, of course, but the Address Unknown funhouse is the best expression of his knack for the weird and provocative, making Max Payne 2 more than just another action game. A Linear Sequence of Scares is one of the most fondly remembered levels in Max Payne 2—which is odd considering you don’t fire a single shot in it. But maybe that’s why. It’s a rare moment of peace among all the cinematic, slow-motion bloodshed, giving you a chance to explore, rather than fight against the world. It’s also just really weird, even for a Remedy game, with a surreal, inscrutable atmosphere that’s undoubtedly inspired by David Lynch, but doesn’t feel like a lazy pastiche of his work. Quantum Break, Remedy’s most recent game, has the odd moment of humour, but otherwise it’s too straight-faced. I don’t know what the studio’s next game is, but I’d love to see it go back to the tongue-in-cheek humour of Max Payne and Alan Wake. I admire its ambition to tell mature stories, but you can still do that with a bit of dark comedy thrown into the mix. I honestly can’t remember a standout level from Quantum Break, but I’ll never forget my descent into the twisted depths of the Address Unknown funhouse.